There are many long-winded, passionate debates that go on within the marketing world. As is natural in online debate, they tend to lose in nuance what they gain in vocal members of each opposing camp. One of these debates that has become very in vogue recently is the question of longform or shortform content? For the (luckily) uninitiated, the debate is whether longer more in-depth content is better or shorter more bite-sized content is more worthy of your marketing efforts. Opinions abound on this topic, and it’s frustrating just how many of them arrive at conclusions that are less than satisfactory. The two main pitfalls in breaking down this debate are that people recommend one over the other definitively, or they only evaluate the utility of either in a very narrow context. 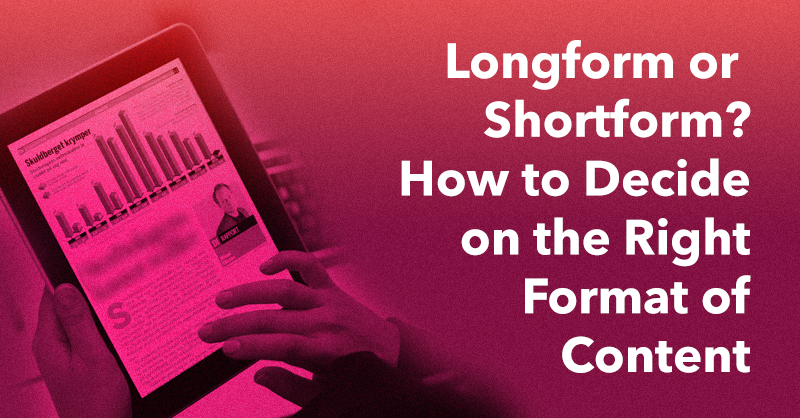 The purpose of this piece is to show that longform and shortform content are equally valuable, and the utility of either is maximized when you know where, when and how to use each. Counter to the traditional funnel approach to viewing marketing, David Edelman instead proposed a circular process with a few key departures from the “whittle-down” methodology of traditional marketing called the Consumer Decision Journey. The most important takeaway is that audiences actively evaluate and add or subtract potential sellers from their decision-making as they progress throughout the buying cycle. In addition, the modern, millennial consumer is much savvier than their mid-century equivalent. Given the access to information and the heightened degree of competition amongst sellers, this evaluation process can be deep and can occur in multiple phases over long periods of time. These multiple phases of brand discovery and consideration are what truly matter when it comes to deciding on content length and depth. Customers might begin by first getting acquainted with a series of brands. In this case, engaging, shortform content will likely work best to draw in the curious and uninitiated. Whereas shorter, more socially-optimized content can be a powerful tool for gaining inclusion within a customer’s “initial consideration set,” it will likely fall short of helping you stand out within the active evaluation process. Roughly speaking the top half of the consumer decision journey will be best suited towards longform content, while the bottom half will be more suited for shortform. This will certainly vary by industry though. In-depth content will factor much more strongly for a B2B’s audience, while shortform content will likely be better suited to addressing impulse-buy items such as snack-food or toys for a B2C organization. Knowing your industry will allow you to change the below diagram as you see fit, but what I am attempting to do here is give you a rough sense of what the middle of the road industry might look like. Having in mind what your content’s ultimate goal will be can give a big clue as to where it falls on this consumer decision journey. Once you understand where it falls, you can start to have a pretty strong indication of whether or not it would do best as longform or shortform content. In addition to taking the phases of consumer decision journey into account when deciding on shortform or longform content, platform appropriateness is also a crucial consideration. One trend that has been gaining more and more traction within the content marketing industry is direct-to-platform publishing. Tailoring your content to each individual platform is now absolutely critical (although many will argue that this has always been the case), and every platform will require content of differing lengths and objectives. These additional considerations can be paired with your understanding of where in the consumer decision journey you want your content to fall to further help you decide on whether you should pursue longform or shortform content. 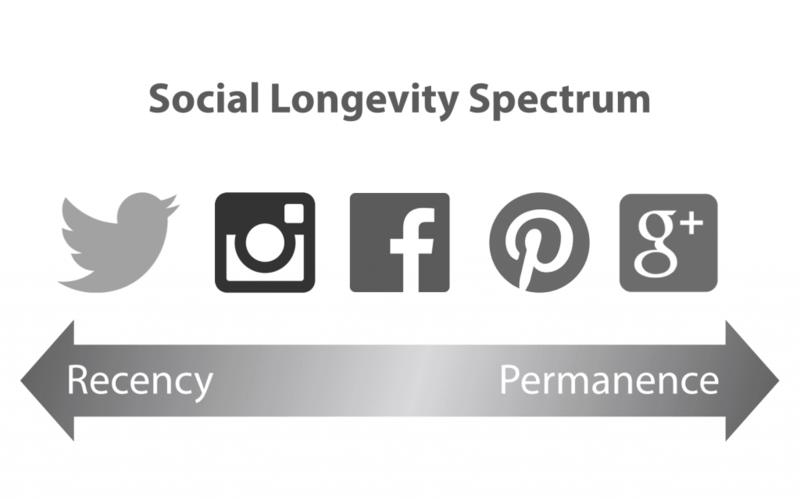 This diagram I created shows roughly how long a social post will last, and I’d argue that this factor pretty closely maps to the correct distribution of long/shortform content. Since that article was published, I would say that LinkedIn and Medium have become serious contenders that would occupy space to the right of Google+ (which has become less of a factor). Although the specifics might have changed the key takeaways remain roughly the same. For example, Twitter requires ultra-shortform engaging content in high volume, whereas (on the other end of the spectrum) LinkedIn Pulse requires in-depth longform content intended to educate and is much more evergreen. Lining these factors up alongside where each piece of content will fall within the customer decision journey can provide a great deal of initial direction on not just whether the length of content, but what the specific objective of each piece should be and where they all fall within a broader plan. A third flaw of the traditional approach to the “longform or shortform?” question is the implied notion that these pieces of content live in isolation. Because I am arguing that both are equally valuable, and that this value is highly dependent on their situation within a broader context; the necessary conclusion is that all of these forms of content need to be linked. Beginning with the consumer decision journey as a blank slate, pair specific channels to each section depending on which marketing channels your brand invests in. After you have mapped different platforms to your customer’s journey, the next crucial step is to map out what each piece of platform-appropriate content will look like and how it will nudge the consumer along to the next phase of the journey. Although it is very difficult to tell if successful brands are using this approach outright, many cohesive, well-executed marketing strategies map pretty well to the formula I have outlined so far. One such brand that does this well is the endlessly savvy and sharp folks over at Jack Erwin, a men’s shoe company. Their marketing strategy and content mix are exactly what I am referring to. Beginning at the top left, they begin by using strong shortform Facebook content (in the form of sponsored posts) to act as the trigger and then follow up with retargeting to enter into the initial consideration set. 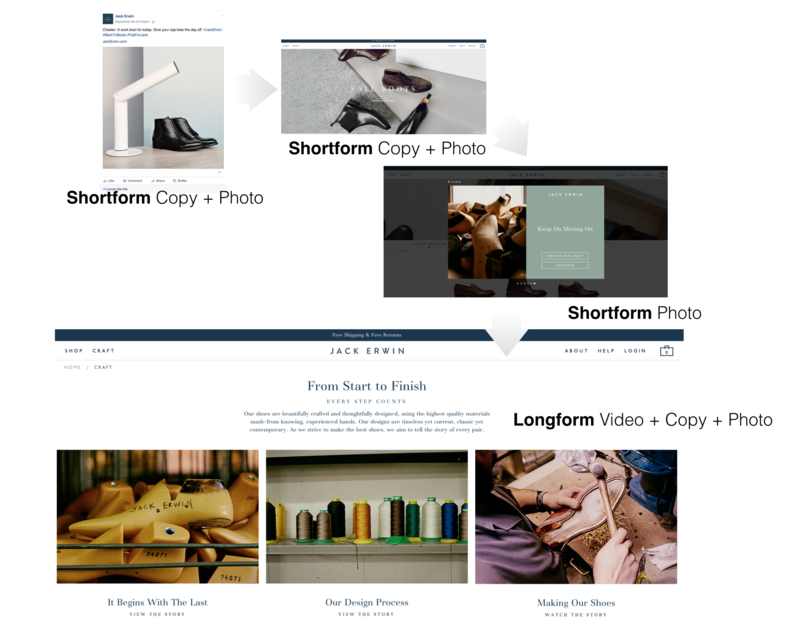 Shortform copy and photography is exactly what fits into our model of the beginning of the consumer decision journey. They then seamlessly ramp up into their own self-produced longform content which takes the form of well-written copy, video and additional product photography. This effort is further supported by longform affiliate content that ranks high for relevant keywords. Post-purchase is further supported by the same social channels as well as a solid email campaign. All of which is meant to edge a consumer along towards ongoing brand loyalty. Even though this content mix is fairly diverse (photos, video, copy, articles, social posts etc.) it all seems obvious and inevitable. That’s because all the while, the consumer decision journey was (either consciously or unconsciously) taken into account. A much less technical argument for organically mixing longform and shortform content is that relying too heavily on either makes your brand dull and might alienate customers. 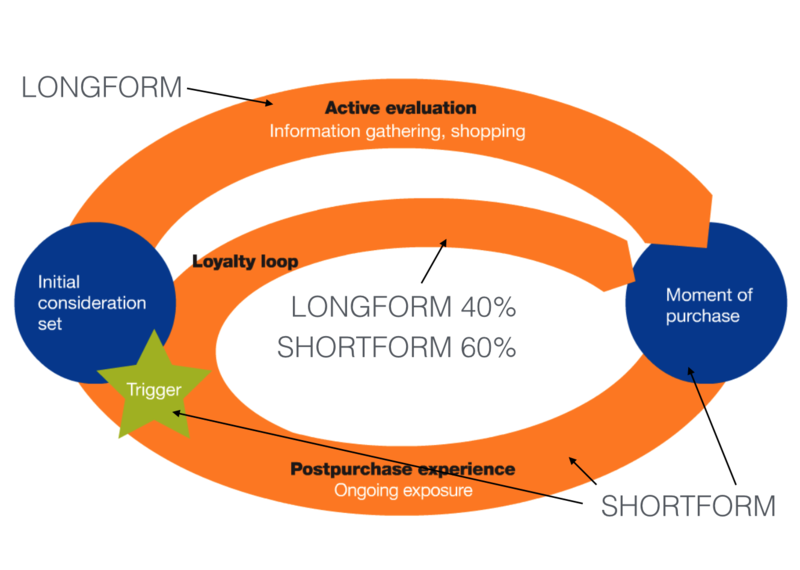 The last bit of the Consumer Decision Journey I haven’t yet mentioned is the possibility of nudging users into a “loyalty loop” where they no longer re-consider new brands before each purchase (within a specific product category) and stick to your brand for all similar future purchases. Fostering this kind of positive feedback loop requires an ongoing relationship that feels natural. Focusing on building content that is appropriate for each channel, sticking to best practices, aligning messaging with your brand and being generous will all ensure that you maintain a healthy and natural mix of long and shortform content. Just think about how much easier Jack Erwin’s job is after combining multiple content types along a coherent and organized consumer decision journey. Instead of potential customers receiving a scattershot slew of messages (any of which might rub them the wrong way), they are instead carried along a seamless and inviting series of quality content. This makes winning loyalty less of a daunting proposition. That’s because over the course of this entire process they have earned that loyalty. The key takeaway of this article is to not look at the question of “longform or shortform?” as a black-and-white question, it’s far more ambiguous than than. • Decide which phase of the Consumer Decision Journey you are targeting. • Choose what platform will best fit the content type and need you’re addressing. • Link each piece of content to the next phase of content in the Consumer Decision journey. 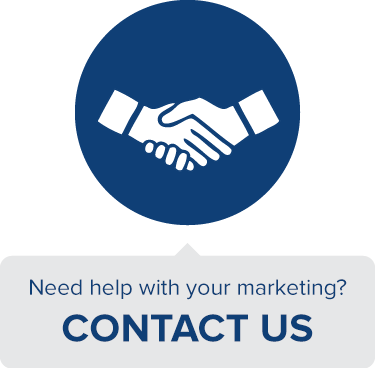 • Use a healthy mix of long and shortform content to facilitate strong customer relationships and brand loyalty.